Since the beginning of the project, we have always wanted to share our enthusiasm and passion for the excavation. We always suspected we would discover some incredible archaeology but even in our wildest dreams, we never expected it would be quite this amazing. We also were keen to do something a little different and be as open and translucent about the actual process of archaeology throughout the entire project. Showing pictures of nice finds and exciting discoveries is great but doesn’t accurately reflect what archaeology really is about. 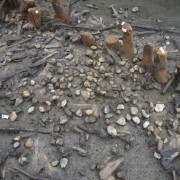 However, we were faced with some difficulties before the excavation began. The Must Farm site is located within a busy, working quarry and logistically, getting people on-site was not easy. After careful planning we were able to schedule in pre-planned tours at set times and we spent a lot of time maximising the number of visits we could fit in. 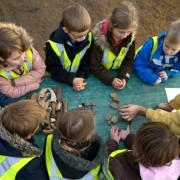 We were lucky enough to be to show hundreds of school children the excavation. While we couldn’t show everyone we wanted around the site, owing to the situation of the settlement, we managed to show over 2000 people the excavation. Over the course of the excavation we were able to show well over 2000 people around the site and it would have been almost impossible to have increased these numbers within that timeframe. 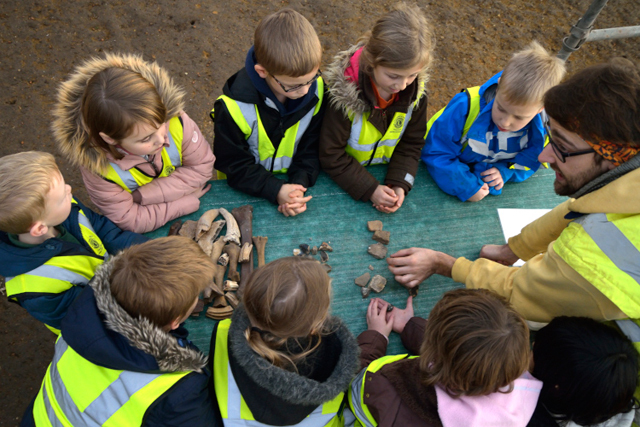 We were also keen to get as many children to see the excavation and ran a number of successful school days, where we have helped show hundreds of young people some fantastic Bronze Age artefacts and archaeology. Given the timescale of the project and the issues regarding access, we always knew there would be many people who simply couldn’t get to the excavation, despite our best efforts. Seeing an archaeological site, and its material, in person is always preferable as there isn’t any substitute for being able to see, and handle, such well-preserved material from 3000 years ago. Yet, we were very keen to do as much as possible and share information on our discoveries and processes in an accessible way. We set about creating and updating social media channels, predominantly Facebook and Twitter and have been committed to updating them as regularly as possible. This hasn’t always been easy as everything is done from the field, usually while we are digging. We also were determined not simply to post photos but also to describe what they showed and provide a little more context about what we were sharing. Equally, we have tried to answer as many questions as possible even when that has involved admitting that we don’t currently know, something many archaeologists are reluctant to do. 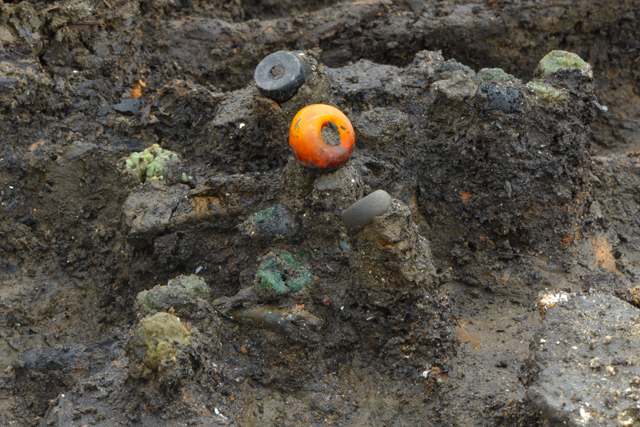 We’ve done our best to share the most interesting finds and discoveries from the site, such as the remains of this necklace, consisting of jet, amber and glass beads. 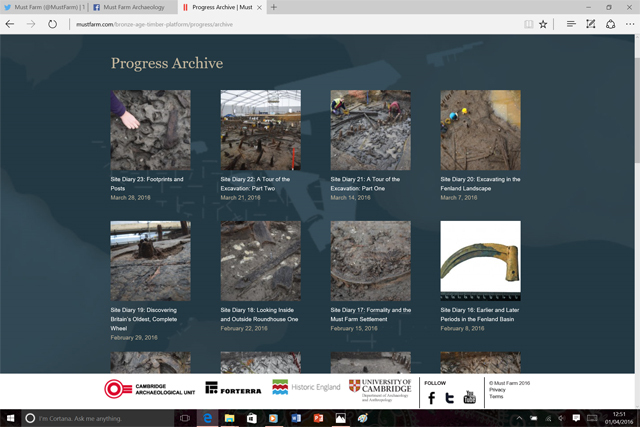 Alongside utilising social media, we also wanted to provide some more detailed accounts of various aspects of the excavation. The diary entries have gone up virtually every week, for 10 months, and have covered a wide range of different elements of the archaeology: from artefact types to environmental analysis. We’ve tried very hard to write these in an accessible way for everyone, whether it is fellow archaeologists, specialists or people with a general interest in archaeology. We had hoped to produce videos from the excavation but sadly this wasn’t possible owing to the timescales of the project. As we were all working on the excavation full-time, producing videos with quality content and good production values simply was not possible. With the on-site excavation reaching its final stages at the moment, we didn’t want to stop our updates about the project. 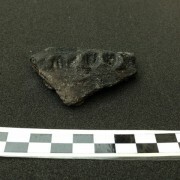 The actual digging stage of any archaeological project is only one aspect of a much larger process of understanding the material and data that are recorded. Stopping our posts and content now would mean an incomplete account of the Must Farm project, which would go against everything we had hoped to achieve. 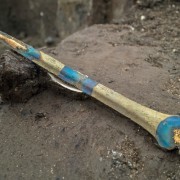 So, we are pleased to be able to confirm that our social media posts and diary reports will continue into the post-excavation stage of the project. The analysis and investigations that form the post-excavation of any archaeology are time-consuming, complex and highly detailed. 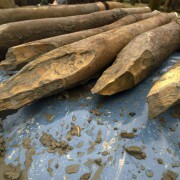 The scientific techniques used involve preparing materials, carrying out experiments and careful, methodical examination of the information gathered. 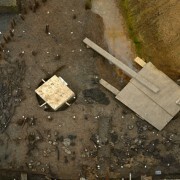 Equally, we also have a lot of data and material to examine that was recorded and removed during the excavation. 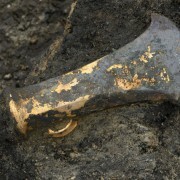 Given the level of detail surrounding these post-excavation investigations, discoveries are made with much less frequency than during day-to-day digging. 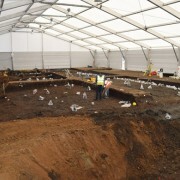 The post-excavation of the site will be time-consuming and involve a wide range of analytical techniques. 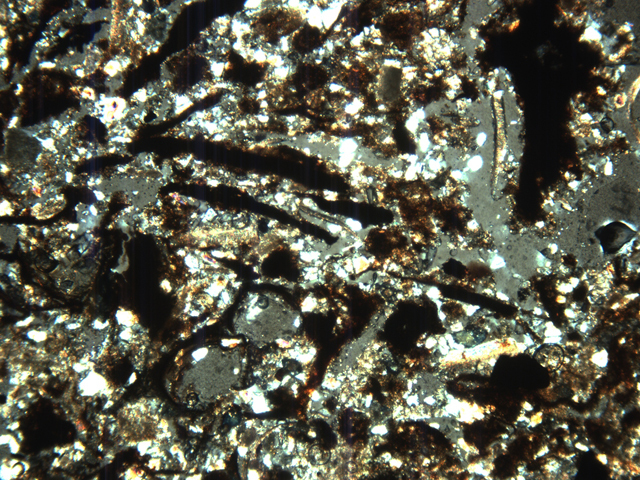 One area the creation and study of soil micromorphs, such as this example from the University of Cambridge Department of Archaeology and Anthropology’s Professor Charles French. 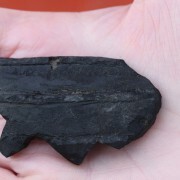 For more on this, see our previous site diary: “Examining our Clay and Turf Material”. 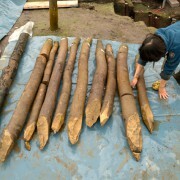 Similarly, many of the excavation team are being moved to other excavations and projects. All archaeological sites require a huge investment of time and attention, so the team going into post-excavation will be much smaller and have many other responsibilities to consider. However, those behind the social media and website are all continuing their involvement with Must Farm, so we hope the content will continue in much the same way. With these changes, it will mean the content will no longer be as frequent as it has been throughout the excavation. Facebook posts and Tweets will no longer be on a daily basis and comments and messages will take longer to reply to, owing to the sheer amount of other work the team will be dealing with. Similarly, site diaries will no longer be posted on a weekly basis as more detailed information and analysis will require more time. Currently, the schedule of how often online updates take place is very much a work-in-progress: we simply don’t know how frequently we will be able to post. However, we are absolutely determined to continue and continue regularly. We are currently working with an intention to post smaller social media updates at least two times a week on Facebook and Twitter. In terms of the longer, blog/diary entries we are aiming to publish an update every two to three weeks. At particularly busy times, they will likely be three weeks and during quieter spells, they will be every two weeks. Our progress section of the website has been expanding weekly throughout the project. We’re planning on continuing these diaries into post-excavation. Once again, we are hoping to be very open and communicative about what is happening with the project. We are one of the few commercial excavations to share this much information about an excavation prior to its publication and we are dedicating as much time as we can to ensuring this continues. We sincerely hope that people understand this change in the rate of posts and diaries and that our readers have enjoyed following the excavation in this way for the past year or so. We’re also currently making some changes to our website, in terms of updating information and adding new content. Over the coming weeks, these will begin to appear and the frequency of our content will start to change. Please bear with us during these changes, we’ll be aiming to make it as smooth a transition as possible. We’ll continue to read every comment and message we receive, but it may be some time before we can reply. In the meantime, if you have any comments or suggestions feel free to contact us via our e-mail.